The satellite’s body has the shape of an octagonal prism featuring fins for stabilization. GOCE has been fabricated with carbon-fiber reinforced plastic components that also carry all structural loads. 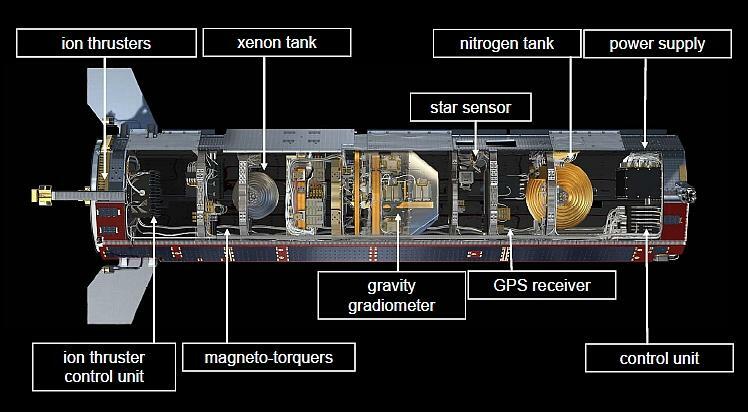 The satellite is divided into seven compartments that house the different equipment. GOCE is symmetrical in shape to avoid disturbances and uses materials with high thermo-elastic stability to provide a very stable environment to its sensitive instrument. Orbiting in a sun-synchronous orbit at a constant vehicle attitude allowed engineers to mount solar panels on the satellite’s hot side that is illuminated by the sun and install radiators on the cold side that is in permanent shadow to keep the satellite’s systems at a constant temperature. Onboard batteries (78Ah) and avionics are used for power storage and distribution as part of a 24-32-Volt unregulated main power bus. The solar panels provide 1,300 Watts of power. 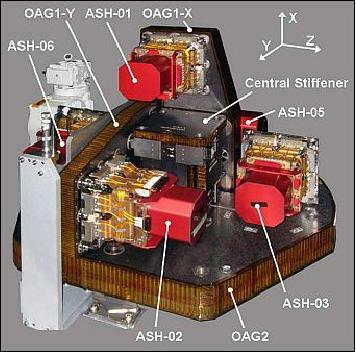 A cold-gas thruster assembly known as the Gradiometer Calibration Device was used to shake the satellite for Gradiometer calibrations. 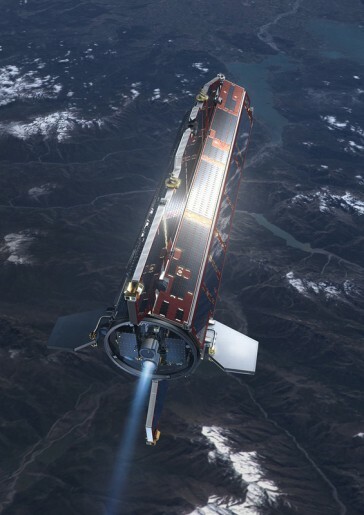 GOCE can operate in Coarse Pointing Mode, Fine Pointing Mode and Drag-Free mode which is the science mode during which the thrusters are operated to perfectly maintain the vehicle’s orbit. 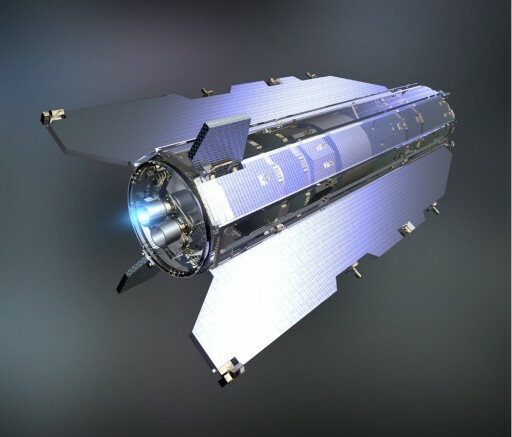 GOCE is equipped with a highly sensitive Electrostatic Gravity Gradiometer, EGG, that measures the all components of the Gravity Gradient Tensor. The instrument is based on an ambient temperature, closed loop, capacitive accelerometer design consisting of three pairs of three-axis servo-controlled capacitive accelerometers on an ultra-stable carbon-carbon structure. The instrument is installed in close proximity to the spacecraft Center of Mass to allow it to make its high resolution measurements. The EGG measures accelerations on all axes with an accuracy of 10^-12 m/s². Even tiny accelerations as a result of Earth’s gravity field can be detected in order to reveal any irregularities. After completing its initial steps in orbit – stable attitude acquisition and the initiation of communications with ground stations – GOCE entered a three-day Early Operations Phase to configure the spacecraft for commissioning that took about 7 months to complete. During on-orbit commissioning, GOCE started to operate its propulsion system, the navigation systems and the Gradiometer. While commissioning was in progress, the orbit slowly decayed to 254 Kilometers at which point the Drag-Free Mode was initiated. After extensive calibrations of the Gradiometer, the GOCE spacecraft entered routine science operations – measuring Earth’s gravity field with unprecedented accuracy in an orbit with a repeat cycle of 61 days. In February 2010, GOCE experienced computer problems, causing an interruption in science data acquisition and Drag-Free Flight while teams configured the backup computer for use. 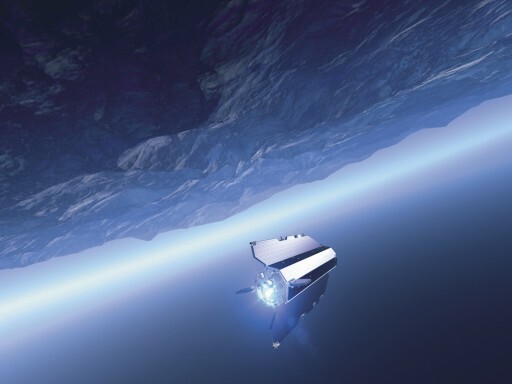 After resuming nominal operations, GOCE again faced technical trouble in July 2010 when the spacecraft failed to downlink science data to the mission’s dedicated ground station in Kiruna, Sweden. The issue was traced back to a faulty communications link between processor module and the telemetry modules of the flight computer. After two months of troubleshooting, teams found a solution – raising the temperature in the computer compartment by 7°C to allow the equipment to function properly. In the summer of 2012, the mission teams allowed the vehicle to drop in altitude as operating the GOCE spacecraft in lower orbits would provide data at higher quality and spatial resolution. The orbit was lowered from 254 Kilometers to 235 Kilometers. 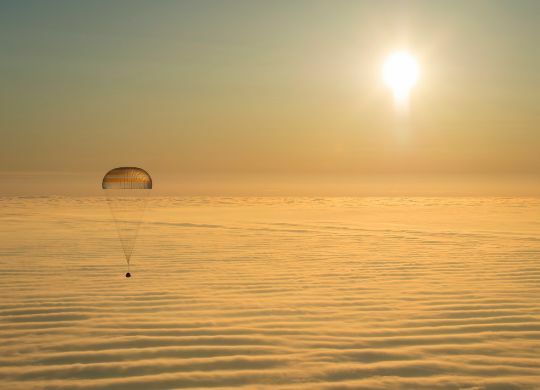 Then in May 2013, the spacecraft was placed in a 224-Kilometer orbit with a repeat cycle of 143 days – flying much lower than any other scientific satellite in Earth orbit. 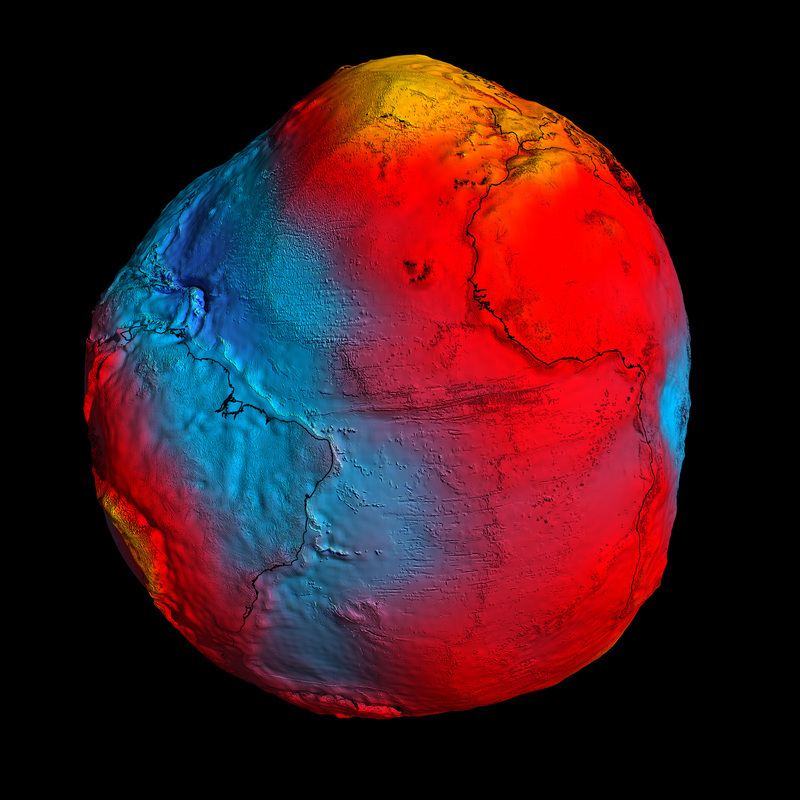 Over the final six months of the mission in the 224-Kilometer orbit, GOCE acquired even better data showing minute local gravity differentials. GOCE is operated by its mission team until its Xenon supply runs out. ESOC Space Debris Office and members of the Inter-Agency Space Debris Coordination Committee will monitor the vehicle’s decay and re-entry to study space debris and orbital decay properties. GOCE has provided unprecedented measurements of Earth’s gravity field allowing scientists to model the geoid with extremely high precision. 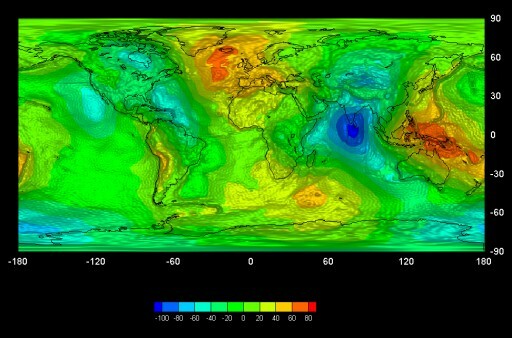 The geoid is a surface of equal gravitational potential that is defined by Earth’s gravity field and its irregularities only – with a hypothetical Ocean surface at rest without any tides. The geoid illustrates how Earth would look if its shape were distorted to make gravity the same at all places on its surface – zones of intense gravity are sticking out while areas of reduced gravity appear as depressions. The gravity model and refined geoid provide better understanding of the physics of Earth’s interior as well as lithosphere dynamics, mantle composition and processes such as uplift and subduction. The geoid is used to make precise calculations of ocean currents, heat transport, sea-level changes and ice dynamics which are important factors affected by climate change. GOCE was able to measure ocean flow patterns in remarkable detail that was better than expected. Additionally, the geoid is used a the reference from which to map topographical features of Earth. 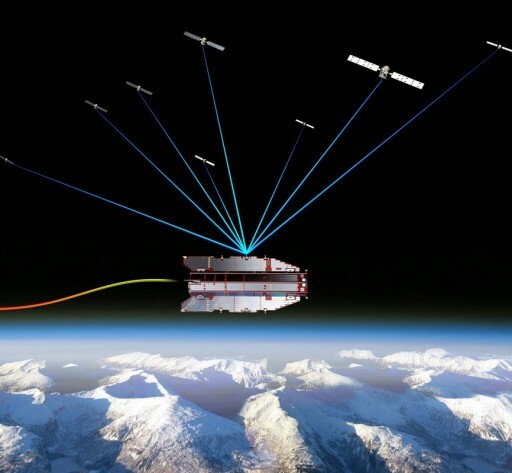 GOCE’s science instruments proved to be capable of picking up even the smallest variations or displacements of the atmosphere at its altitude. This became apparent when GOCE detected sound waves from the March 11, 2011 earthquake that hit Japan. Sound or pressure waves are amplified as they pass into the thin atmosphere where GOCE was flying. Combining GOCE measurements with numerical models to examine the propagation of low frequency infrasound waves was something that had never been possible before. In 2012, scientists released a map showing the global Mohorovičić discontinuity, the boundary between the crust and the mantle ranging from 70 Kilometers in depth in the mountains to 10 Kilometers beneath the ocean floor. This offered new clues for understanding the dynamic processes of Earth’s interior that lead to an irregular subsurface density distribution. In addition, GOCE enabled scientists to study the lithosphere and plate tectonics & mantle convection. GOCE also measured flow patterns and winds in the uppermost portion of the atmosphere by detecting forces that were not related to Earth’s gravity. Atmospheric density measurements were also made as a function of drag experienced by the spacecraft.